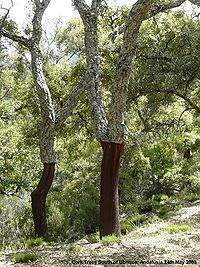 – Plant a cork oak tree. – Remove the bark and discard it. This is the first-growth bark. – Remove the bark and put it aside to dry. This is the first harvest of second-growth bark. – “tube” the corks out of the strip of bark by cutting them with a sharp cylindrical cutter. – At this point the cork is called “natural” (never mind the dangerous substances…). Its surface is pitted with a certain number of small holes (or large cavities!) which define the quality category of the cork. – If you want to give the cork a smooth appearance, especially when there are a lot of holes, you can shake it violently in a mixture of glue and cork dust, until the holes are plugged up. This is the filled cork. – Natural or filled, you can dip it in paraffin or silicone. Paraffin is interesting because it lasts a long time (at least 20 years, beyond that you have to replace the cork anyhow…). On the other hand, for DY wines (drink young), corks with paraffin will be hard to remove, and that’s all it takes for a winemaker to be boycotted by lazy sommeliers who prefer to sell bottles that are more easily uncorked. Silicone coated corks are easier to remove. – Join the “charter of cork manufacturers” if you want to sell your corks. For the winemaker this is no indication of quality, but at least it ensures that all suppliers are using the same language, especially in terms of dimensions and quality. Certain manufacturers still use terms like “lines” instead of millimeters (don’t ask how many mm in a line, I’ve forgotten and I don’t want to remember!). The same can be said about classification, where exotic terms like “Extra”, “Extra plus”, “First choice”, or “Reclassified first choice” have disappeared, luckily, to be replaced by the Charter classification from 0 to 7. Zero is the top grade (regarding a grade 7 cork, submarines can pass through its caverns! You have to see it to believe it!). – Develop a sales pitch to market your cork. 1- Second growth bark. Because the cork is “tubed” sideways, you can observe on the round side the bands that mark the age of the bark. You can see this better on corks that have not been used yet, but sometimes also on used ones, on the side that was not in contact with the wine, especially if it was not too deformed by the corking machine. In short, you can see that the 15-year rule is rarely respected. One would be very glad to find 12 tightly spaced bands, but often one finds only 6 or 7 wide ones! Narrow bands indicate slow natural growth, wide bands are a sign of accelerated growth, typically using irrigation (so much for ecological production: irrigating in Portugal?). Obviously it’s more profitable to harvest every 6 years instead of every 12 or 15. The problem is that wide bands affect the resilience of the cork, its capacity to regain its shape after being compressed (and how!) by the corking machine. 2- Drying. Did it really last 2 years? Were the barks warehoused in closed hangars or were they left outside, exposed to rain, heat, cold, pollution, bugs, etc.? This is quite common, try driving around Portugal, Catalunya, Sardinia or Andalusia and you will see them. Under such exposure there is a risk of the cork developing the horrible fungus known as “yellow stain”, which generates 2,4,6-Trichloroanisole (TCA), the main chemical responsible for cork taint. Chemical treatment can limit the damage, but the price of the cork rises as a result. 3- Filling. This practice allows one to gain a grade point. But the winemaker that buys these corks is irresponsible, because all the holes are plugged, the cork looks attractive, but what about real quality? As in many things in life, in the world of corks one must not equate length with quality. It is better to use a 0-grade 45×24 natural paraffin coated cork than a 5-grade 54×24 filled silicone coated cork. On the other hand, prices are quite variable; one can go from a given price to 5 times that without any difference visible to the naked eye. For instance, a 45×24 grade 0 cork costs about 23 cents, and a 38×24 grade 3 cork costs about 6 cents. These are average prices, and they depend on all the manufacturing factors mentioned above. I first wrote this article ten years ago; a more recent development in cork marketing is the well orchestrated campaign to “save the cork”, mainly by the large Portuguese manufacturers (half the world’s production), who resort to all kinds of sentimental drivel like “the lynx will lose its habitat if we stop using corks in our wine bottles”. The fact is that cork stoppers represent a very small percentage of world cork usage, about 15% by volume. But that 15% is worth twice as much as the 85% of cork production destined for industrial use. So even if we stopped using cork stoppers, the industry would not disappear at all, the lynx would continue to roam. It is another kind of beast that would be in danger of extinction: profits. Jamie Goode, in his excellent blog, discusses recent agit-cork in the UK. He declined the petition. I would also decline: cork production is not as clean as it seems; we would be better off with a smaller better cork production for wines to be cellared, and for DY wines (the great majority) cheaper non-cork closures that would be safer and more ecological than intensively grown irrigated chemically treated filled corks. I would feel a lot more sympathy for this industry if they started observing the above recipe, instead of taking shortcuts. A true quality drive would gain back the favor of those of us who are tired of dumping 10% of our bottles down the sink because the cork was contaminated, and who are thus inclined to the new Stelvin screwtop closures. The extra costs of top quality corks would be more than offset by the extra margins that could be generated. And the lynx, assuming there are any in those intensively grown Portuguese forests, would be guaranteed a safe European home. I live in Provence, around Bandol AOC, on the shores of the Mediterranean. My profession, which has nothing to do with wine or food, allows me to travel a lot, plus I am a volunteer organizer of Slow Food, so I organize food and wine events and I am lucky to have plenty of occasions to sample all the wonderful terroirs of the world. I created this blog as a community outlet for stories and information about wine and food, with a lot of help from my friends.